“For many of us, meeting new people can be an anxiety-inducing affair. Am I talking too much? Was my handshake too weak? Did I make too much eye contact? Too little? Am I boring? Are they boring, but they’re boring because I’m boring? It can be a mess! All of our worst social paranoias contained in a single interaction. Fortunately, it is relatively easy to become better at listening and asking questions. First and foremost, you need to make asking questions your main priority when networking and forget about all other business development goals such as meeting potential new clients, getting referrals or closing the sale. You may find this counter-intuitive, after all, aren’t achieving your business development goals the whole point of networking? No! The point of networking is to develop and deepen relationships. Sure, we hope that those relationships are the seeds that, when nurtured over time, will grow into business. If we’ve put the time in to figure out who our ideal client is and prioritize our business development so that we are at the types of events that will lead us to our ideal clients, we increase our odds of this happening (https://maraia.com/2018/09/11/aint-nobody-got-time-random-acts-lunch-worst-thing/), but for now simply making connections is our only goal. Once you’ve cleared your head of the pressure of trying to make a sale or get a referral, amazing things happen: you relax, you stop sounding salesy and, most importantly, you can focus on what the person you’re talking to is saying as opposed to thinking about how you can turn this conversation into a business opportunity. Ironically, when you stop trying to turn conversations into business opportunities, you will have deeper connections, which will increase your chances of creating a business opportunities over the long term. Asking great questions and listening whole-heartedly when networking takes some planning and practice. 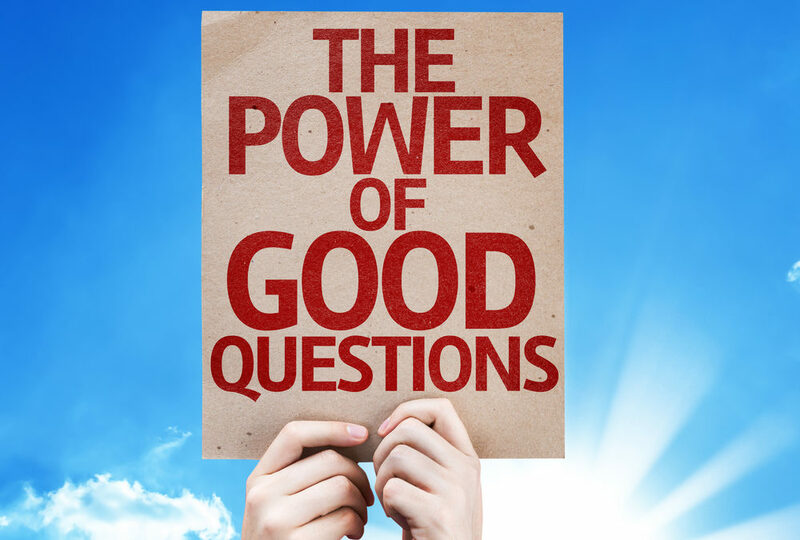 It’s easier to start a conversation when you have a few prepared questions in mind and it’s easier to have a great conversation when those questions are “High Energy Questions.” HEQs are open-ended questions designed to infuse the conversation with curiosity and naturally lead to follow-up questions in a way simple yes or no questions don’t. Key to having great HEQs at your disposal is to write out your HEQs in advance. Most busy professionals want to skip this step, but I implore you: if you do nothing else to increase your revenue this year, do this! It seems simple, but the act of writing out a few HEQs in advance of the networking event serves several important functions. First, you will be forced to consider whois going to be at the event in order to craft relevant questions. Not only does this naturally flow to thinking about why they’re there and what their needs might be, it will also help inform your understanding of why you’re there and whether it’s a useful networking event for you to get the most bang for your rainmaking buck. Second, it will take you out of sales mode and put you into listening mode. It is hard to tell people how much you can do for them (sales) when you’re busy asking them questions, instantly putting both you and your conversation partner at ease. Lastly, it will make you look like a natural. The idea that more you practice, the less practiced you seem is never truer than in the arena of small talk! What is one thing that people unfamiliar with your industry would find surprising? As you can see, these questions all demonstrate curiosity and leave ample room for follow up questions. Often, once the conversation is going, the follow up questions come naturally. If you struggle with follow up questions, remember this acronym: TALK. Think about what the listener is saying. Ask questions based on what you hear. Listen to the answer carefully. Then demonstrate that you Know what they just said by repeating their answer back to them in form of a question. For example, “You say you got started in accounting because you couldn’t get a job as an actress? What did you study in college, acting or accounting?” You showed you listened to what she said, you’ve validated what she said by repeating back to her and you’ve asked a follow up question that gives her an opportunity to continue talking about her interests. When she leaves this conversation, she’ll remember you as someone who listened sincerely and showed you cared and she will like you more for it…exactly like the Journal of Social and Personality Psychology reported! Rainmaking might not be easy, but it is simple. Asking HEQs and listening thoughtfully are simple tools that the best rainmakers use to create lasting connections and build relationships which generate business. Try jotting down a few questions before your networking event and see for yourself how well it works. Everyone strives to be successful and well liked and by simply asking questions, you can be both! At Maraia & Associates, we’ve been helping professionals grow their business for over 25 years by teaching them the tools of successful rainmakers. Contact us today if you’d like a free electronic copy of Rainmaking Made Simple to learn more about High Energy Questions and how to build revenue through relationships.